"We need more movies like this one. Wholesome. Entertaining. Full of great principles and lessons. A fun story for the whole family to enjoy." - Luis Palau, World Evangelist. "The Lost Medallion is a wholesome movie that will take you back to a more innocent time but will keep you on the edge of your seat. My kids loved it and have watched it again and again. You'll be blessed by The Lost Medallion and I'm guessing that you will still be talking about it with friends and family for a long time after you leave the theater." - Alex Kendrick, Co-Producer & Co-Director of Facing the Giants, Fireproof & Courageous . "As much as I've been encouraged by the growth of the Christian film "industry" over the last several years, it's been obvious that most films have been dramas targeting adults and occasionally teens. I've been silently hoping for an action adventure geared toward preteens. With "The Lost Medallion," I get my wish, while potentially thousands of young people get their very own "Indiana Jones"-ish big screen motion picture to boot. What's more, not only will they be entertained, they'll get a few strong spiritual nuggets to ponder as well." - Bob Waliszewski, Director, Plugged In: Focus on the Family. The Lost Medallion DVD by Kaos Entertainment;Bill Muir (Producer) was published by Authentic in January 2014 and is our 5005th best seller. The ISBN for The Lost Medallion DVD is 5060256821151. This is the best "Christian" movie that I've seen for kids ever. I had all of my four children (ages 4, 8, 9 and 13 - 2 bouys and 2 girls) watching this and enjoying it. If you're old enough it's kind of like "The Goonies" meets God. Exciting, touching and deep. Was aimed for those who do and those who don't know of the love God has for them. Unlike some "Christian" movies this comes with a no cringe guarantee and some great acting given the ages of the children involved. Well, what are you waiting for? Buy it now. PS The best movies for adults that I've seen are "To save a life", "Courageous" and "Unconditional". Go get them too. Got a question? No problem! Just click here to ask us about The Lost Medallion DVD. Does it have english subtitles? Finding the lost medallion is only the beginning of this adventure story where the children are the real heroes. When Daniel Anderson (played by Alex Kendrick from Christian movies Courageous and Fireproof) visits a foster home to drop off donations, he's roped into telling the kids a story. Daniel weaves a tale about 13 year old Billy Stone (Billy Unger) and his best friend, Allie (Sammi Hanratty), who uncover a long-lost medallion and wish themselves back in time 200 years. Archaeologist Dr. Michael Stone looked for the lost medallion his entire life and now his son Billy has taken up the search. Amazingly, the medallion ends up in Billy's hands and a spontaneous wish in a precarious situation suddenly whisks Billy and Allie back 200 years to what they realise is a very different Aumakua Island. When Billy and his friends are not jumping off waterfalls, avoiding animal traps, crossing the ocean, sneaking through caves or escaping a prison they're facing their nemesis, Cobra, who wants nothing more than for them all to disappear. 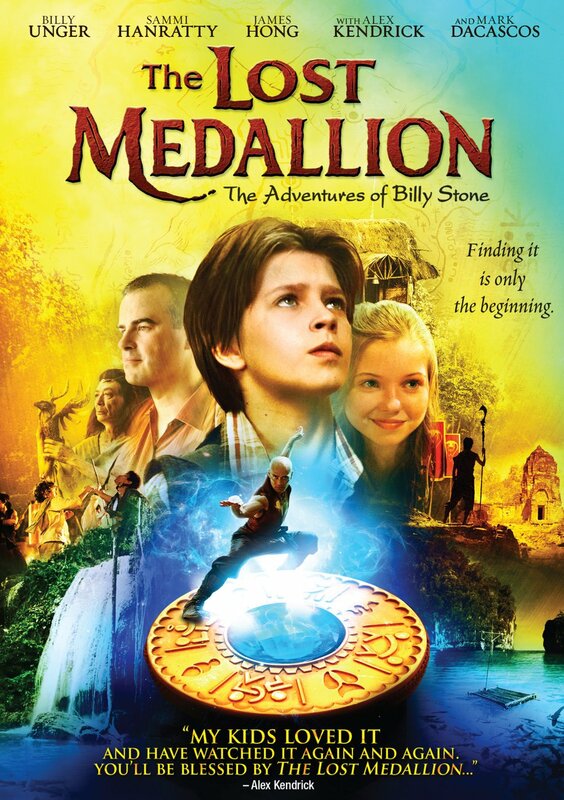 With no other way to get home and with the well being of the entire island resting on his shoulders, Billy must discover the key to reclaiming the medallion and its tremendous power. One way or another, this adventure will change Billy, and life on the island, forever. The Dove Foundation Review : Family Approved for ages 12 and over. Kids will love this movie because it features children who emerge as the heroes of the story. The movie contains a nice theme of the benefits of working together as a team to solve problems. A family entertainment movie created primarily for preteens - ages 10 to 12, the film is rated PG (parental guidance) for its adventure, violence and action content. However, none of the violence depicted is graphic, gory or terrorising in nature. This DVD is Region 2, and will be in your UK DVD Player.